This year’s election is finally coming to an end, and as expected I didn’t watch any of the debates. Did I miss anything? Did the candidates acknowledge that the generations born after 1957 or so have, on average, been paid less at work at each phase of their lives than those born earlier? And that they have been disadvantaged in public policy, as past tax cuts, additional spending on benefits for today’s seniors, and richer public employee pensions for those cashing in and moving out have been paid for by soaring public debts, higher taxes, a deteriorating infrastructure, cuts in pay and benefits for future public employees, and likely poverty and ill health in old age for younger generations as the country goes broke and their senior benefits are cut? Did anyone talk about the 30-year party of paying people less but selling them more, with the difference covered by soaring public and private debts and inadequate retirement savings? Selling off pieces of the next generation’s future to pay for imports in excess of what we export? Did anyone talk about the crisis of demand in the economy because those age 58 and younger have less to spend and are retiring into poverty? The crisis of investment because businesses no longer have an answer to the question “who are you going to sell to, and where will they get the money to pay for it given falling wages?” And the fact that no one knows how to solve this other than yet more borrowing – to be paid by someone someday – to keep the debt-driven economy going a few years more? Did anyone express concern that U.S. life expectancy is falling for those born after 1957 or so after having risen for – decades, if not centuries? Or express regret about the diminished childhoods of those coming of age in the 1970s and after, due to choices adults made to prioritize their own wants over family stability, and the reverberations of that on younger generations’ own families and children? Did anyone talk about where the country will be going the next 20 or 30 years as a result of what has been done during the past 20 or 30 years? In fact, when I enter the names of the two Presidential candidates and “generational equity” in Google, the only stuff that comes up is stuff I myself have written. A debate worth watching would have had Hillary Clinton and Donald Trump apologizing on behalf of their generations. Senator Clinton would have apologized, in particular, on behalf of a political/union class that is taxing more and delivering less as a result of past self-enrichment, particularly in places dominated by Democrats such as New York City. Donald Trump, in particular, would have apologized on behalf of tycoons who paid themselves richly while often creating little of real value, based on financial engineering, tax games, and government-created bubbles – before being bailed out by zero percent interest rates. And in particular, apologized for higher federal taxes and future cuts in senior benefits as a result of the tax cuts and breaks the executive/financial class got, particularly in Republican administrations. Instead, the former pretended things were fine while promising only to tread water with respect to our mortgaged and diminished future – making the current and future deficit and crisis no worse that it already is. While the latter provided rationalizations for Generation Greed while identifying scapegoats. This country has reached the point where it has become more and more difficult to cover up the damage from selling the future (now the present) so that those in generations could take more – and some of them more than others – and put in less in the present (now the past). The fact that younger generations have been left worse off as a result is something almost universally known but never spoken of, particularly not in this campaign. But it shows up in the data, which also implies that many people have found themselves much worse off than they once were as individuals. The data wasn’t discussed either. There are so many comparisons that could be made using recently-released American Community Survey data for 2015 and the first day of ACS data in 2005, I’m surprised there isn’t one in the news every day in every place. Particularly when the data is easily accessed here. As noted previously, those in retirement are getting richer as the less well off “greatest” generation dies off and the richest generations retire. The best off generations in U.S. history are now age 59 to 86, and many are enjoying years of leisure and benefits that those following will never see. Meanwhile those in their pre-retirement years were hit hard in the Great Recession, as were those just entering the labor force. As a result, in a continuation of a long-term trend, average work earnings are down, not only because of the business cycle but also in a long-term sense. 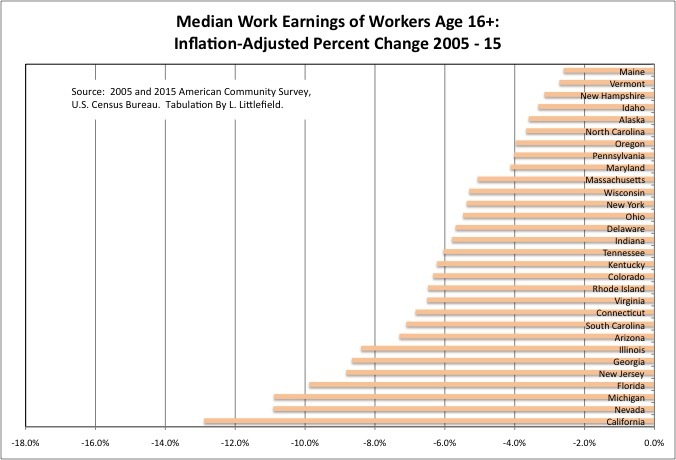 One sees this by comparing 2005, three years after one recession hit bottom, with 2015, five years after the low point of the Great Recession, in this case for all workers age 16 plus with work earnings. The spreadsheet with this data is here. One finds that in almost every state median earnings per worker (half of all workers earn more, half earn less) is down significantly when adjusted for inflation. The worst off is California with a huge reduction of 12.9% — not what I would have expected given that the Bay Area of California is one of the few places where those at the top are still getting ahead. These days even hedge fund managers living in New Jersey and Connecticut are finding out that happens to top predators in an ecosystem when the bottom of the food chain collapses due to excess predation. Median earnings for this population are down by 8.8% and 6.8% respectively. The decrease for New York State is 5.4%. The only places where median inflation-adjusted work earnings increased over a decade are states that benefitted from the oil and gas boom and other mineral production. But that boom has collapsed in a massive bust, so now these same states are seeing their residents’ income fall. 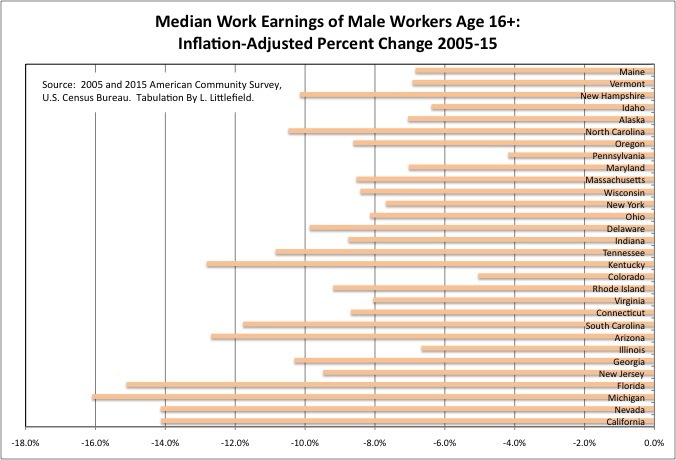 The decreases in median work earnings have been even greater for males, and are in some cases enormous. We are talking about 16.1% for Michigan, 15.1% for Florida, 14.1% for California and Nevada, 12.8% for Kentucky, 12.7% for Arizona, 11.8% for South Carolina, 10.8% for Tennessee, 10.5% in North Carolina, 10.3% in Georgia, 10.1% in New Hampshire, etc. This is at a time of low inflation, so it isn’t just a case of wages rising but not keeping up with fast rising prices. Meanwhile, as the cost of public employee retirement continues to rise, many people in these states are facing tax increases and service cuts. Men still tend to earn more, on average, than women, but this isn’t just a case of women getting ahead at the expense of previously advantaged men. 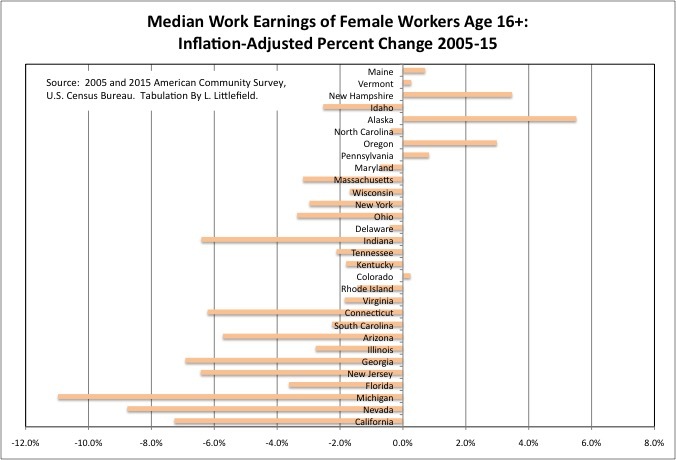 In most states the median inflation adjusted earnings of women fell was well. And my guess is that the only reasons it wasn’t worse for women are the same reasons their pay was lower to begin with. Women are more likely to work in fields such as health care and social services where the pay may not be high, but with revenues coming from the government it didn’t fall as much either. Women are now more likely to complete college. And women may have already been more likely to be working part time in 2005 as a result of family responsibilities, whereas more men are working part time now because they have no choice. For men and women doing the exact same work for the exact same hours and effort, my guess is the gap between male and female earnings is much smaller. And so is the difference in how hard those in each gender were hit in the past decades. With these kind of decreases in median work earnings, would you believe that the big “progressive” idea floating around in the election has been increases in Social Security benefits for the already-retired in excess of the rate of inflation? Paid for how? The same way the tax cuts were paid for. By someone else someday. Most of those now working are unlikely to get pensions, let alone the retroactively enriched pensions older generations of public employees got. Their Social Security is set to be cut 25 percent in 2020. Having saved less for retirement and borrowed more to offset their failing wages over the decades, rather than cut their lifestyle, their income is set to plunge even more when they are no longer working. And their spending and standards of living will decline drastically. And they will be forced to pay higher taxes out of their shrinking incomes to pay for everything Generation Greed promised itself while also voting for politicians who promised tax cuts – and if unionized voting for two-tier contracts with lower pay and benefits for future workers. These changes, and other negative social changes for those in younger generations, are huge, huge, huge. And what came out in the debates? Building a wall. Hillary Clinton’s e-mails. Donald Trump’s dating habits and attitudes, none of which should have been any surprise to anyone. What a joke. Meanwhile, my member of Congress, who has been out of the news since asserting that there was still slavery in New York State in 1898, is running for re-election unopposed. If she has done anything in all her years in office, word of it has not reached me. I suppose Senator Schumer has an opponent, but apparently not someone who has said anything of note, as I have no idea who that is. I only know Schumer is up for re-election because he has a few ads up, saying nothing of consequence. The long time member of the state assembly in my area has successfully designated his replacement by not announcing his retirement until the day petitioning started to get on the ballot, so no election there either. I hate to admit it, but I’m not even sure who has been assigned to pretend to represent me in the State Senate. Whoever it is, they have never been heard from. This is a society in decline. And the only real issue in this election is which tribes of people in Generation Greed will profit the most from one more score at the expense of a future they don’t care about, and those who will live in it. Bernie Sanders, the “candidate of the young,” proposed something similar. And why do Fannie, Freddie and the FHA keep increasing the percent of their income homebuyers can pay in debt? So that the price of housing can be bid up, and poorer younger generations can pay more to those selling and heading for Florida, that’s why.